In a wide range of e-commerce ideas regarding starting an online store business, today we would like to highlight an idea of building a custom sticker online store. Sticker designer software by Alt-team company is a good choice in this direction because it includes a powerful shopping cart platform and functional Sticker design tool. Before delving into details, let's answer the first question “What is a sticker?”. There are three terms which are usually used interchangeably – sticker, label, and decal. All of them have an adhesive layer and can be attached to some surface. But what is the difference? A sticker is actually an umbrella term for all stickers, labels, and decals. But a sticker in its original meaning is a die cut piece of paper or plastic which can be stuck to some surface and serves small decorative or entertainment purposes. Sticker becomes a label if its main purpose is to educate. Labels usually contain information concerning the product they are affixed to. A decal is a specific type of sticker which usually serves a decorative purpose and is made to withstand environmental conditions like heat, cold, sun, moisture, chemicals or abrasion. So, car stickers are actually decals. The durable vinyl material is the most popular for such decal stickers. It was an introductory but necessary foreword for first-timers and now let's have a close look at online sticker designer, it's features and possibilities. Sticker designer from Alt-team represents a tool which allows customers to make their own stickers online and provides the necessary functionality for an administrator. choose background color for a sticker. set up the availability of the design tools (alignment, order, flip, arc, rotation, corner radius tools). By installing Sticker designer software, an online store owner can provide different sticker design services for customers and give an unlimited swing for one's imagination. If you are wondering "What for can I use Sticker designer? ", read below. Actually, sticker design tool reveals lots of possibilities. Car/bike sticker design, bumper stickers. Many people are passionate about their cars or bikes and won't miss an opportunity to decorate their four- or two-wheeled friends by creatively personalized stickers. Stickers for cars and bikes can be fun, political, warning, safety, photo, decor, every possible. Bottle labels and food stickers. 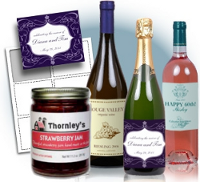 Custom sticker design ability allows people to create homemade bottle or food gifts. A bottle of wine with personalized sticker telling "Happy birthday!" is more than a gift, it's a drinkable greeting cart which will be definitely appreciated. Or why not to decorate with a sticker a box of chocolates for your girlfriend to make an impact or just stick a creative label to coffee or honey jar to make a personalized present. Stickers can be used for home purposes, just to let your husband know that salt is kept in this container and sugar is in this. Wall/window decals for home or office. Decorative wall stickers are a modern and creative approach to adding a completely new look to one's interior. 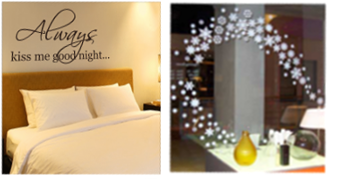 Such decals can be easily applied to any surface - walls, glass, bathroom tiles, wood, etc. and definitely bring a positive spark in one's home or office environment. Custom die-cut sticker pages. 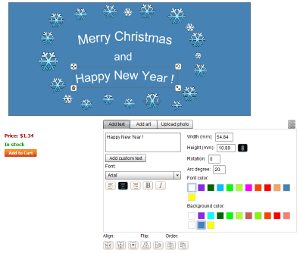 By using sticker designer customers can create their own sets of stickers for fun or other purposes. All parents buy such sets of stickers for their kids because kids love “peel and stick” activity. Custom stickers for any occasion. 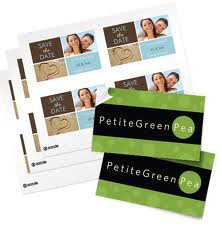 Here we would mention party invitations, birthday stickers, stickers timed to a certain event which can be affixed to doors, greeting cards, postcards, gift packages or wherever your imagination tells you. Fridge magnets and button badges. 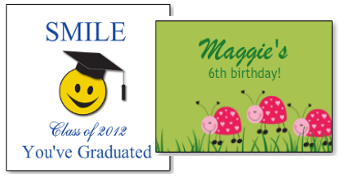 Having a basis material for magnets and badges, you can easily provide your customers with an opportunity to design their own fridge magnets and button badges with any possible text or image. Such products can become a keepsake small gifts or serve fun, educational and other purposes. So, you may see how versatile Sticker designer possibilities can be. And it's not a complete picture, more ideas include cd/DVD stickers, furniture decor stickers, guitar stickers, floor decals, mobile phone stickers, boat stickers, envelope stamps and even more. Starting custom stickers design online store business is a fresh, out of the box e-commerce solution, the very idea is definitely competitive and profitable providing good realization and promotion. We hope this article made you more aware of the sticker designer possibilities and features. By using Sticker designer software with Sticker design tool you can give customers an opportunity to make custom stickers online that can be used for various purposes including but not limited to interior and exterior decor, gifts, and fun. Can the sticker design software be setup for use within an ebay shop/listing?